As usual those who should know better claim that 'Family trumps all'.... except when it blatantly doesn't. 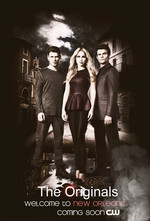 A certain deceased character reappears in the form of Klaus hallucinations. Whether this improves/elevates the character in question is ... debatable. Human corpses are left strewn around New Orleans like so much confetti, and no mere mortal organizations appear to notice. People continue to play kick the puppy with sweet, naive, Josh. The Magical Big Bad of the season (?) continues to be mysterious and evil, whilst also being a sub-par series of special effects.